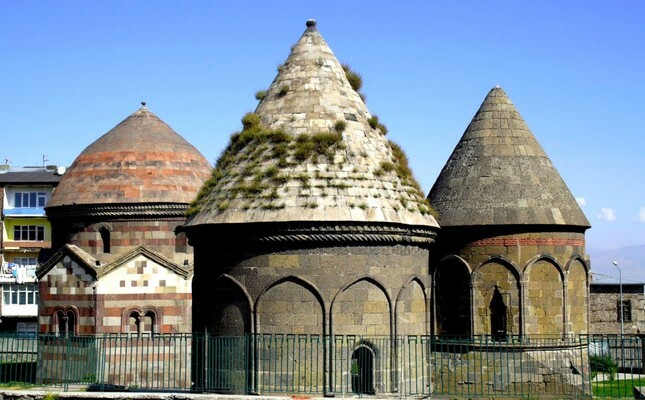 The restoration of Üç Kümbetler (Three Domes) and the construction of 13 boutique hotels are continuing in an area of historical buildings in the Yakutiye district of Erzurum province. According to a statement made by the Yakutiye Municipality, when the restorations, started by the municipality seven years ago, and construction are complete, the city's culture, religious tourism, accommodation and gastronomy needs will be satisfied. Mayor Ali Korkut said Thursday that work on the boutique hotels and the restoration of Üç Kümbetler is rapid. "We'll introduce the hidden beauties of Erzurum to the world. This place will be a pioneer in changing and developing the city. Our work, which we started in 2011 as 'megaprojects,' continues," Mayor Korkut said. He noted that the municipality paid nearly TL 100 million ($21 million) to publicize the restoration area. "The construction of 13 boutique hotels with 300 beds continues. We pay attention to gastronomy and accommodation issues along with culture and tourism. We will not only reveal historical values but also revive tourism here. Üç Kümbetler is our giant project, and we cannot make a mistake," he concluded.